I see the warning below pretty often. I run a fairly stout firewall in the office to protect us from the wild web. Among other things, it protects us from spyware. Most of the time it just blocks individual items that try to load on a page, but for the worst offenders it blocks the site entirely. The warning below is because an advertiser is using a third party company to administer their PPC campaign. That third party company configured the PPC campaign so it goes through their system first before landing on their client’s site. Often this is to load cookies on the clicker’s computer so the campaign administrator can track users and report to their client. The trouble is, businesses like ours that run spyware-blocking appliances will never reach the landing pages even though advertiser just paid for a click. 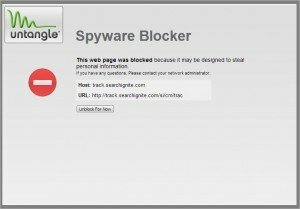 Technically, Google can charge because they delivered the user to the destination set in the campaign, which tried to load spyware and was subsequently blocked by my own firewall. If you use a PPC admin company, be sure traffic can get through their intermediary URLs. There’s another player that causes problems for this kind of user tracking: antivirus software. More and more antivirus software is filtering web traffic to protect their users from spyware in addition to viruses. 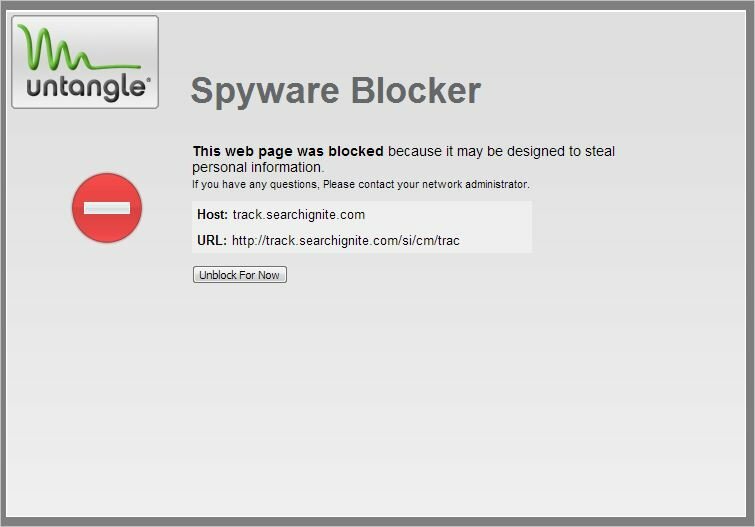 Most of the time my firewall catches the traffic and I see the warning above, but sometimes if my firewall isn’t aware of the threat, my antivirus software intervenes and blocks the webpage from loading. Currently the impact on PPC campaigns from this issue is probably pretty low. However, antivirus software companies are constantly trying to increase the sophistication of their products to stay competitive. I think that means a lot more consideration needs to be given to the use of intermediary landing pages.